If you live in Arkansas, Louisiana, Maine, Missouri, Rhode Island, or Vermont; you aren't eligible to joing the Amazon Associates program. Moreover, if you join the Amazon Associates program and then move to any of those states, you become ineligible to participate in the Program, and Amazon will terminate their operating agreement with you on the date you establish residency in that state. So, what's an affiliate marketer who lives in AR, ME, MO, RI or VT to do? Well, they should sign up for merchants' with a wide variety of products and affiliate programs which don't exclude people from their states from joining. 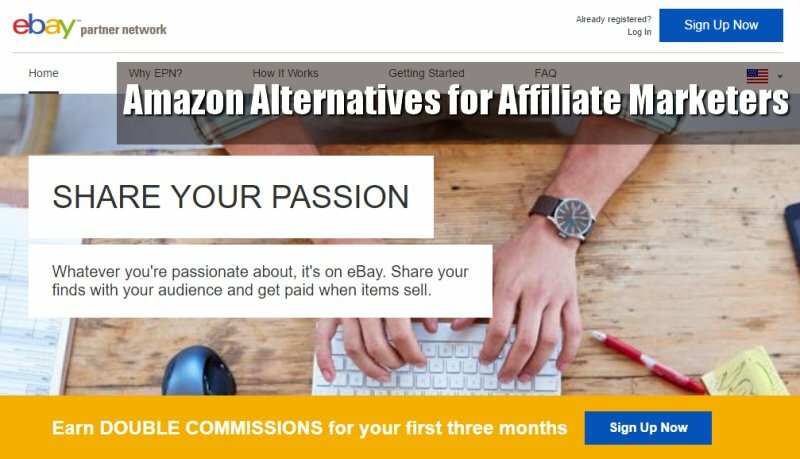 Affiliates in the Ebay Partner Network earn double commissions for the first 3 months after they join. With 162 million active buyers shopping, there’s no end to the great listings that you can share with your audience. We have 5 million sellers offering nearly $70 billion in gross merchandise annually. Plus eBay has global reach, operating in 13 countries around the world. Check out the Ebay Partner Network. Formerly known as CSN Stores, Wayfair, INC is an American e-commerce company founded in 2002 that sells home furnishings and décor items. Apparently, Wayfair affiliates benefit from dedicated in-house management, 5% commissions, a 30-day referral period (cookie length), and over two million products available through their data feeds. I say ‘apparently', because although I am a big fan of Wayfair and a stellar customer, they declined my affiliate applications. Try signing up for Wayfair's affiliate program on the ShareaSale network. Home Depot's current commission rate is 3% on products, mobile, and buy online pick up in-store orders and 5% on custom blinds. One day cookies. Homedepot.com and Homedepot.ca operate separate affiliate programs through CJ by Conversant. Earn up to 7% commission on Overstock.com’s broad range of products including: Apparel & Accessories, Books, Movies, CDs, Games, Electronics & Computers, Home & Garden, Jewelry, Sporting Goods, and Handmade Goods. Data feeds are available in both .CSV and .XML formats. Overstock's affiliate program can be found at CJ by Conversant. You can earn 5 – 8% on apparel, accessories, home and outdoors goods, between 3 and 5% on baby gear and furniture and 1% on health and beauty products. They have a 7 day cookie and send a weekly newsletter with updates on promotions, contests, and sales opportunities. Target's affiliate program is run through the Impact Radius network. Walmart's programs are available through the Rakuten Affiliate Network. Best Buy claims to be the #1 retailer and most trafficked website for consumer electronics. Their commission rates vary between 0% of sale on Gift Cards, Warranties & Apple Tablets/Laptops/Desktops/iPhone Hardware/Watches, to 0.5% of sale on remaining laptops & tablets and 1% of sale on All Remaining Categories. You can also earn a $10 flat fee (bounty) on Geek Squad SKUs and a $5 flat fee for mobile plans. Best Buy's affiliate program is on the the Rakuten Affiliate Network. Amazon isn't the only game in town when it comes to having millions of users just primed to buy the stuff you want to promote!! Nice list Roz. I would also like to throw SFI/TripleClicks into the mix. Great place to sell or auction your own products. Also, SFI has absolutely the best training course/book I have ever seen. Would say it is at college level. Email me if you would like to discuss this…Zero dollars ever to join, sell, promote, etc….ever!! They also have their own business building penny auctions!! I live in one of the banned states. Wrote the Governor and Attorney General and Amazon, and everybody said ‘Too bad, so sad.” Actually Amazon got on their high horse about states that charge sales tax just because they have operations in their state. I think it is so unfair, but what can you do? Glad that you have provided all these alternatives. Thanks! Great alternatives, Rosalind 🙂 I must admit that I do prefer Amazon, but these 7 are some very great and well known companies. Keep up the writing great content like this! And Clickbank? What do you think about it? I love Clickbank, Moira, but I was trying to present merchant’s with a broad range of goods, more comparable to Amazon. Thanks for letting me know about that. I’ll have to look closer at their operating agreement to see what other exclusions they might have. Always wanted to try affiliate marketing. Thanks so much for the post. Thanks for this latest email, and all the tips on those various affiliate programs available. There are quite some variations, but with all those choices we should all be able to find something to match our knowledge & expertise! I just wanted to say that I’ve been following you (but not in a bad sense!!!) since 2004, shortly after I’d discovered Corey Rudl. His tragic death was a considerable loss to many involved in this niche. In his bio I recalled reading he was raised in the Cornwall – Brockville area. Then just a year or more ago while driving a full sized tractor-trailer, hauling Wal-Mart goods, I discovered the family name (still!) on their country mailbox. I’m not currently trucking, so ought sometime take an hour or 2 out of my day enroute to Cornwall on business, just to give them my condolences in person. It really did knock me for a loop at that time, while only knowing Corey on paper, in books, on email, and for a short time, as he put the spirit I needed, just following the sale of our dairy farm, and looking for something I could do! Well you followed his path very well Rosalind, and I thank you for that. But you keep up those great emails and your sage advice, as I really do appreciate your efforts. Thanks kindly for sharing. Corey certainly passed way too young. I had the pleasure of meeting him at a conference only a month before his death. How interesting that you came across his family farm! BTW, wave at the Nav Canada Training Institute for me. Spent much happy time there when I was in FSS and ATC.